Though Lion OS will be released by this July 2011, but I got the chance to play around with it in my Windows 7 computer by using desktop virtualization software VMware workstation. I already covered how to install Mac OS X 10.7 Lion on VMware workstation. 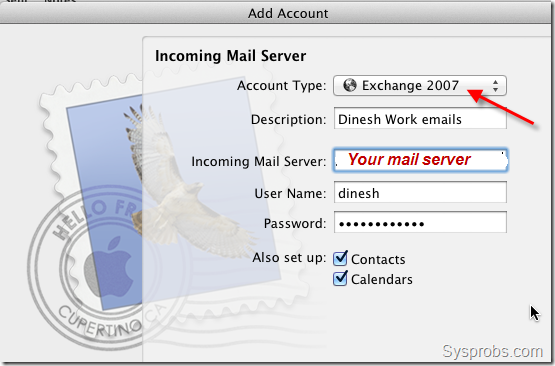 Exchange 2003 is not directly supported by Mac OS X 10.7 Lion mail. As I said in earlier step, evenExchange 2007 needs SP1 with rollout 4 or latest versions to work properly with Lion OS. So, old Exchange 2003 is not supported here. Again you have only two options to connect Exchange 2003 with with Lion mail. IMAP and POP, these two connection types are having few limitations and can’t get full fledge working Lion mail client with Exchange 2003. In this case, you can go for separate mail clientapplication ‘Entourage’ in Lion OS X to work with most of the Microsoft exchange versions. I’m sure this small guide with screenshots would have been helpful to understand the requirements to connect Exchange 2003, Exchange 2007 in Lion mail client in Mac OS X 10.7.